Talk about close calls. It could have been the worst disaster in Connecticut history. On January 17, 1978, a Tuesday evening, 4,746 basketball fans watched the UConn men’s team upset UMass 56-49 at the Hartford Civic Center. About six hours later, in the early morning of January 18, the roof of the sports coliseum collapsed onto 10,000 empty stadium seats. No one was in the building and no one was injured. 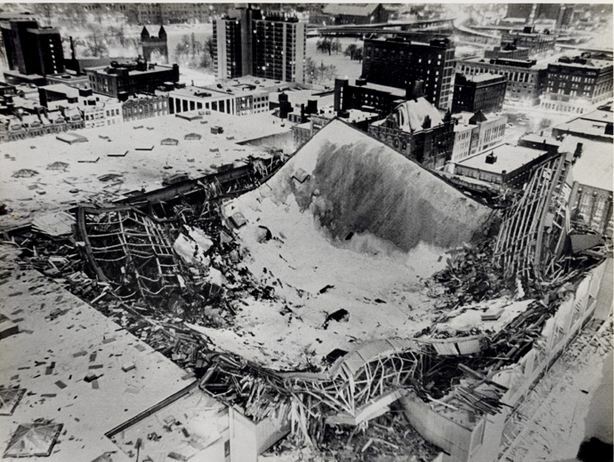 Construction of the Hartford Civic Center had begun in 1972. It was one of four major urban renewal projects in Hartford begun in the 1960s, including Constitution Plaza, Windsor Street, and Bushnell Plaza. It promised to bring new vitality to the city with restaurants, retail shops, a hotel, and a sports coliseum—the new home for the World Hockey Association team the New England Whalers. The roof of the Civic Center embodied this optimism. Designed and tested with a complex computer program, the unique structure consisted of unusual pyramidal trusses and was supported by just four columns in order to provide an unobstructed view for every spectator. The “space truss” roof was assembled on the ground and lifted into place in 1973, another innovative and cost-saving technique. Overall the cutting-edge design saved the city half a million dollars. It collapsed five years later. The roof did not fail due to the heavy snow that fell on that January night. According to the official City investigation, the roof began progressive failure as soon as it had been installed. Contributing factors included design errors, an underestimation of the weight of the roof, and differences between the design and the actual built structure. 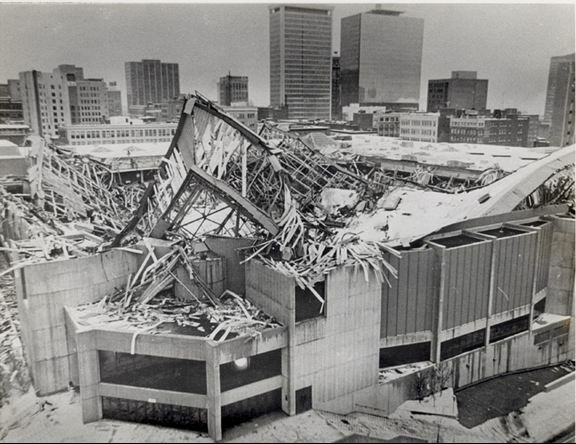 The roof was rebuilt in 1980, bigger and better, and still rests unbending atop the same four columns in what is now the XL Center. The columns are 12 feet higher, allowing more seats. The National Hockey League’s newly-named Hartford Whalers also returned that year for another 18 seasons. Today the Veterans Memorial Coliseum is the largest sports and entertainment facility in Connecticut and home to the Hartford Wolf Pack (briefly renamed the Connecticut Whale for three seasons) of the American Hockey League. Ben Gammell is Coordinator of Interpretive and Education Projects at the Connecticut Historical Society. © Connecticut Public Broadcasting Network and Connecticut Historical Society. All rights reserved. This article originally appeared on Your Public Media.